Hi, international buddies! I’m talking to you readers from Australia, Canada, India, and the UK. Have I got a deal for you! I’m running an International BookBub deal starting today. For a limited time, you can buy the first novel in my Winston Wong series for only 99 cents (65 rupees in India) on Amazon, Apple, and Kobo. 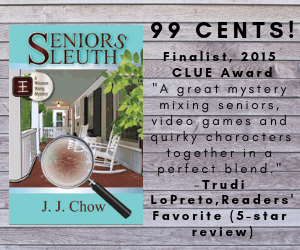 Seniors Sleuth is a CLUE Award Finalist book and currently has 56 reviews with a 4-star rating. It’s even blurbed by an Edgar Award-winning author! Want a few more reviews? Spread the word about this amazing opportunity!